The last time the Kansas City Royals were good like this, about 35 years ago, a scorecard wasn’t necessary to see who was in the lineup on a daily basis. For the most part, there were very few rental players. Position players pretty much stayed anchored with their respective teams. The days of guys like George Brett playing an entire career with the same team are no more. 13 of the 25 players on the Royals World Series roster last fall were not on the team a year earlier. There are concerns about this team this season. Is there enough there to make a run at the big stage for a 3rd consecutive year? I don’t think so and it doesn’t sound like I’m alone assessing the Royals chances. A couple of national publications have the Royals winning fewer than 80 games. They won 95 last year. Skeptics are out there. The Royals do have holes in this lineup. The uncertainty at 2nd base could be an ongoing issue this season. The Royals dodged a bullet last year after Omar Infante went belly up. He had the worst on-base percentage in baseball and lost his starting job. The Royals acquired Ben Zobrist as a rental player who turned out to be a key cog in bringing the World Championship back to KC. Zobrist had no intention of resigning here. He wanted to play for his good friend, Joe Maddon, who now manages the Cubs. I digress. Infante is now 34 and scheduled to make $17 million the next two years. The Royals have to decide if they want to eat that contract or go with the younger Christian Colon. The other concern is right field. The plan includes platooning Jarrod Dyson and Paulo Orlando. It sounds to me like it’s a plan the Royals have forced on themselves because they have no other option. Dyson has been a bench player the last 4 years. It’s obvious the team has doubts about his ability to be an everyday player. He’s adequate in the field but he can’t hit lefties. He’s a .211 career hitter against southpaws. He has no power. Orlando is a journeyman late inning replacement, nothing more. 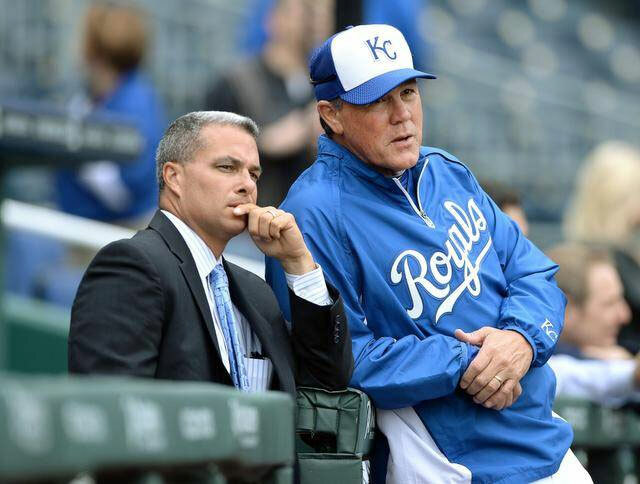 Dayton Moore and Ned Yost appear to be buying time hoping Bubba Starling can bust through and finally help this team in the outfield. This is the one major criticism I have of Dayton Moore. He’s been unable to fix right field. The Royals General Manager had to dole out millions in arbitration hearings this winter. The royals expect to tack on another $17 million in payroll boosting the total to $130 million on opening day. They saved money cutting bait with Alex Rios and his $9 million dollar salary. Dyson and Orlando are cheap replacements. While being critical of Moore, I do feel he’s done an outstanding job with the bullpen. It’s no secret it’s the biggest reason the Royals have made back to back trips to the World Series. I recall Tony LaRussa once saying “show me a bad bullpen and I’ll show you a manager in trouble.” In this case both Moore and Yost saved their own hide when they found late inning relief. In turn, their future is secure for as long as they want to work in KC. Both re-upped last week. Not many GM’s and Manager’s in baseball have that luxury of security. Not many owners can make money with only 4 winning seasons in 16 years and still draw 90% of capacity for home games. That’s a testament to the baseball fans in this community. While the Royals are basking in glory, their fans need a little love tap on their shoulders for enduring that horrible stretch of bad baseball, which now appears to be in the rear-view mirror. That makes all of us feel a whole lot better these days.